Christofer Macatsoris, music director at the Academy of Vocal Arts, is a sterling Puccini interpreter, but performing a concert version of “Il Tabarro” and “Suor Angelica” is brave even for him. The two one-acters from “Il Trittico” are so atmospheric and the plots so intense that it is risky to have singers in tuxes and gowns able to put the complex characterizations over without costumes and sets. In a tentative, soft entry, the AVA orchestra seemed atypically soft with “Il Tabarro,” but soon enough it was vaulted Puccini noir, in which Michele, the dock boss who oversees the gritty, transient life of the workers and becomes suspicious that his wife, Giorgetta, is having an affair one of them. Baritone Eric Dubin as the boss and Mo El Zein as Luigi have the potent dramatic presence in these parts, though they both had difficulty with pacing in some scenes. Even with a few technical struggles, they delivered strong vocal performances. Zein was powerful during the very difficult “Folle di gelosia” passage, one of the trickiest tenor moments in all of opera. Dubin, a returning AVA alum, is a baritone-bass with fluid command. Jan Cornelius’ Giorgetta can be added to her stellar AVA repertoire of lead soprano roles. Her chemistry with both men was riveting in its emotional truth; nothing seems out of her reach vocally. Margaret Mezzacappa as Frugola, equally great as the comic relief, singing about her cat and salt-of-the-sea truths, light and witty, was mezzo thrilling. “Suor Angelica” couldn’t be more tragic, and Macatsoris wisely doesn’t let the drama overrun the subtleties of character from the singers or the musicians. Angelica, having given birth out of wedlock, has been banished to the cloistered life at the abbey by her noble family. Seven years on, she is visited by her aunt, who brings her the news that the son who was ripped from her arms has been dead for two years. 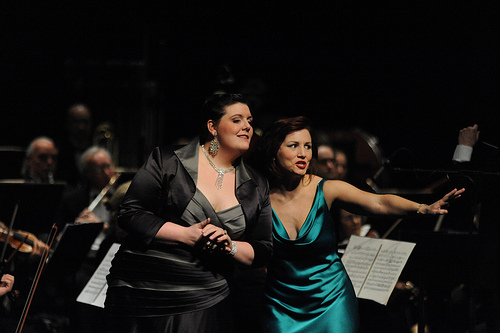 Soprano Corrine Winters was riveting in the lead and gave a luminous performance. Mezzacappa has distinguished herself in every role the past two years at AVA and here showed great range in one program. In the coveted role of the Principessa, usually reserved for older singers, she tells Angelica, her niece, that she must sign over her family estate to her sister’s dowry and worse, that Angelica’s son has died. Mezzacappa has such surface cruelty, but there is much unrelenting human tragedy in her voice that it breaks your heart with stony gravitas delivering the terrible news. Puccini takes his heroine to a diva-dangerous place as she tries to take her own life to join her son, before realizing that she is committing a soul-damning sin. Emotionally and vocally, this requires a certain luminous skill. In Winters’ case, the word would be transcendent. As much as possible, Macatsoris kept it all about the music, the orchestra sounding fine in the chamber-size Perelman Theater, producing even more sonic clarity than in AVA’s regular studio venue on Spruce Street.